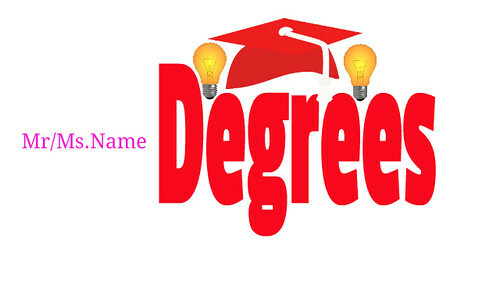 Why do People Include Degrees after their Names? I am not jealous. Just curious. Why do people include their degrees after their names? The above two category of people at least studied for their degrees. There are another class of people who, for Rs. 8000, complete an online multi-choice questions exam to ‘earn’ a distance education certification (something like PGDBA or a certificate course) from unknown institutes and add ‘MBA’ after their names! Even these people do something to get their degree. There are people who chase papers, bribe authorities & even buy degrees without attending classes, and still proudly exhibit them against their names. I don’t have anything against all this. But I have one doubt: Why don’t these people also display their properties, clubs they are a member of, foreign trips been to this year, which company their brother-in-law is employed, sofa sets they own, LED TVs, and of course – iPhone 6S, etc. after their names??? I mean — If you want to boast, boast about everything no? Why stop with Degrees, that too in this era of commercialized education? You can ‘buy’ even Ph.D. here from reasonably ‘good’ universities. They have got right people to give them! They have got the ‘wrong’ people to give them! Excellent post. Remember my comment on your post “My Blogger Visiting Card”? I would rather have just my name only on a business card. Interesting thing happened when I got married. My in-laws printed the invitation showing my degrees after my name. When I saw them, I insisted they remove the degrees from my name as well as their daughter’s name. Marriage is between 2 people and not between 2 degrees. Glad to know. I too don’t like putting degrees after my name. I have met so many of such people and hey are just so annoying. Their entire life revolves around showing off even in front of complete strangers! Good point. But the way I see it, you can use it to influence others or let them know something about you. But again, some people over do it. I wonder why they don’t include LKG and UKG too. I am in no position to criticize this practice as I have myself written a lot of things in my card! But there is a thin line between information and boasting. As a child I thought that I would include my degree before and after name… But when I finally cleared it, I realised that it doesnt matter… So, I understand what point you are trying to make! I think its just a mad rush to show off, and sorry to say very common amongst us indians, I say so because at my IT job we get emails from our indian office and each one has a signature describing all they have done.. and then I get emails from people here and hardly find anyone putting the degrees in the signature.. I guessed this practice might be more popular in India than in the west. And rightly so! For some it matters and some doesn’t, but I think people from lower statues or first generation to education this is something need to be exhibited to motivate other coming from the same class. My father had done B.sc (first generation in his family then to enter college) but I never seen him using the degree except his official ID card when he’s in service. Yes, it can be a motivation for some people. But people use it more to brag than motivate! I may be wrong, however. Yes, I have seen so many people include degrees after their names, making them look like their name itself! I remember days in my intermediate, when our Physics sir goaded us to study well, so that we can put an ‘Er.’ short for Engineer in front of our names just like Doctors use Dr.! I had a fascination with writing degrees after my name as a child too. I used to write Manu, L.K.G as a signature in most of my father’s books! Made me laugh when I saw them as I grew up. we had included degree of my husband in our wedding invitation. This was done intentionally to let some people know as there were some evil relatives who thought I will not get a qualified husband, since I was “over-qualified”. 😛 But agree, these days degrees can be bought. Card has space – need to write something, na?